JF-17 is a multirole fighter aircraft co-produced by Chengdu Aircraft Industries, China and Pakistan Aeronautical Complex, Kamra to replace the aging fleet of Chinese made F-7P/PG, A-5s and French made Mirage III/V combat aircraft’s over the span of 30 years. Designing started back in 1998 under the project called “Super 7” which was intended to develop a low-cost and a versatile aircraft, capable of integrating modern ordnance and weapons system. 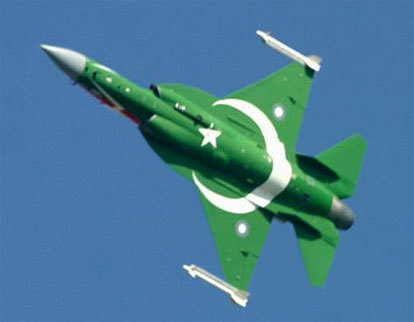 After the completion of design work in 2001, JF-17 did its maiden flight in 2003. Airframe was then redesigned according to modern standards and implemented in Prototype 4 of the JF-17 which included DSI air intakes, New Landing Gear, modified rudder and tail compartment etc. First delivery to the PAF took place in 2007 when 2 fighters landed at Kamra AFB which later took part in 23rd March parade of 2007. In the three years, PAF received 14 more jets and on 18th of February, 2010, PAF inducted JF-17 in its No. 26 fighter Squadron known as “Spiders” which was based at Peshawar AFB replacing the A-5C Fantans. Following the induction, PAF added two locally manufactured JF-17s to its fleet and now the serial local manufacturing of JF-17 is underway. JF-17 is all-weather combat aircraft capable of undertaking almost all the roles, from close air support to strategic attack, Combat air patrols to Reconnaissance. It can fly missions at both day and night with all precision guided air to ground stores, standoff weapons and a variety of air to air weapons which will be certified for use with the JF-17 Thunder. JF-17 has a maximum ferry range of 2037km and a maximum combat radius of 1352km with speed of Mach 1.8. It has a service ceiling of 54000 ft with the climb rate of 154 m/sec. The JF-17s Chinese made KLJ-7 radar’s multiple modes allow surveillance and simultaneous engagement of multiple air, ground and sea targets, of which a total of 40 can be managed. Using the track-while-scan (TWS) mode, the radar can track up to 10 targets at beyond visual range (BVR) and engage 2 of them simultaneously with radar homing air-to-air missiles. The operational range for targets with a radar cross-section (RCS) of 5 m2 is stated to be ≥105 km in look-up mode and ≥85 km in look-down mode. JF-17 weights around 6,411 KG with its maximum takeoff weight of 12,474 KG. The avionics software of JF-17 is based on civilian C++ Language which makes its Motorolla 88000 microprocessor functional which then powers the avionics of JF-17 Thunder. The aircraft’s glass cockpit incorporates an Electronic Flight Instrument System (EFIS) and a wide-angle holographic Heads-Up Display (HUD), which has a minimum total field view of 25 degrees. The EFIS is made up of three color multi-function displays (MFD) providing basic flight information, tactical information and information on the engine, fuel, electrical, hydraulics, flight control and environment control systems. The aircraft is also equipped with Fly by Wire [FBW] control system which controls the movement through its own computer and Hands on Throttle and Stick [HOTAS] feature which enables the pilot to fly the aircraft effectively and comfortably. For primary means on communication, the JF-17 is equipped with VHF/UHF radios. Furthermore it can also be data linked to an AWACS/AEW platform for more precise view of battle field and advanced situational awareness. For defensive purposes, the JF-17 is equipped with Radar Warning Receiver which warns the pilot for any incoming Radar guided missile or even any missile lock. Furthermore, Chaff and Flares are also to be used as the last line of defense against the incoming missiles. Air Weapons Complex has also designed the Air Combat Maneuvering Instrument [ACMI] which records and simulates the actions taken by the aircraft during combat and training exercises. Defense systems like Self Protection jammers, Identification Friend or Foe [IFF interrogator/Transponder] system, Helmet mounted sight/display and Forward looking infrared [FLIR an imaging technology that senses infrared radiation] are equipped on JF-17. The JF-17 is equipped with single Russian made RD-93 Turbofan engine which produces 19000lb of thrust enabling the aircraft to achieve the 0.99 Thrust to Weight Ratio [TWR]. RD-93 will soon be replaced with Chinese made WS-13 which generates more power and has relatively low operational costs. It is currently in final stages of development. JF-17 is expected to perform all the roles which currently PAFs collective fleet of A-5s, F-7s and Mirages perform. For this purpose, Jf-17 is equipped with 7 external hard points, 2 on wing tips for air to air missiles, 4 under wings and a single center-line hard point. These hard points can carry state of the art weapons both Air-to-Air and Air-to-Surface. The primary air to air Beyond Visual Range [BVR] missile of JF-17 is Chinese made SD-10 which has maximum range of 100kms. It is the latest missile which the Peoples Republic of China Air Force is using on their latest J-10 Vanguards, which are sought to be the most lethal fighters in Chinese inventory. For With-in-Visual Range [WVR] or short range missiles, JF-17 can carry Chinese made PL-5C, PL-7, American origin AIM-9L/M Sidewinder, South African A darter, French made MICA air to air missile and Russian made Aspide air to air missiles. They have a operational ranges ranging from 1km to 18km except for A darter which has an operational range of 60km. Anti ship missions can be carried out with French made ASM-39 Exocet Missile and newly acquired Brazilian made MAR-1 ASMs. Air to Groud weapons includes Mk.82 Mk.84 GBU-10, GBU-12, Durandel, Rockeye, and Chinese equivalent air-to-ground weapons, unguided rockets. JF-17 can also integrate RA’AD Air Launched Cruise Missile which has a range of 350km. JF-17 is also equipped one internal GSh-23-2 twin-barrel 23mm cannon. JF-17 is expected to cost $15-20 Million with Chinese hardware. Whereas cost can be further increase by the integration of European systems like Italian Grifo 7 Radar and AESA radar etc. JF-17 is the only modern combat aircraft available with the lowest price tag and state of the art capabilities. It directly competes with Russian made Mig-29 which is intended for export to African and South East Asian countries. It is not only cheaper to buy but also has lowest maintenance cost with respect to Mig 29 due to JF-17s single engine and Mig-29s twin engines. In the span of only 9 years, JF-17 has evolved to a full fledged 4th generation fighter and has now joined the combat squadrons of Pakistan Air Force. JF-17 was designed with the versatility of F-16A coupled with the capabilities of more advanced F-16Cs on the price tag of an F-5 Tiger II. This makes JF-17 the first choice for the countries with low budget and in need of a highly capable multi-role fighter aircraft. PAF intends to induct JF-17 in mass number. Order for 250 jets has already taken place which includes the batch of first 50 fighters equipped with Chinese avionics and radar system. Whereas the rest of the batches will be integrated with non-Chinese hardware. Being an infant platform, JF-17 has a lot of room for improvement which includes equipping of JF-17 with Advanced Electronically Scanned Array (AESA) radar system, advance armament like American made AIM-120C AMRAAMs, AIM-9X Sidewinder, Joint Direct Attack Munitions (JDAM), South African R-Darter etc. Several nations have expressed their interest in JF-17 which includes Azerbaijan, Egypt, Malaysia, Indonesia, Turkey, Bangladesh and Philippines. China is also reported to have plans regarding the induction of JF-17 in their front line Squadrons. For more details & discussion, join the fan club of JF-17 Thunder on PakWheels forums; JF 17 – Fan Club.